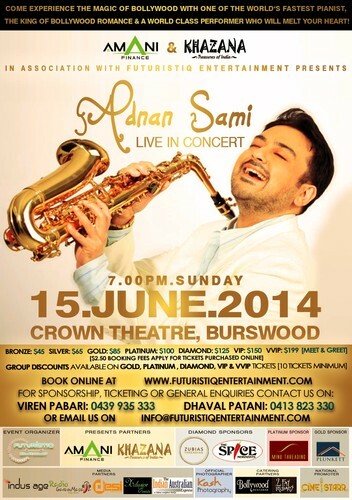 Amani Finance & Khazana in association with Futuristiq Entertainment would like to invite you to the Mega Bollywood Concert featuring Adnan Sami on 15th June 2014 at Crown Theatre, Burswood WA. He is a versatile performer who mastered Indian and Western classical/semi-classical, jazz, rock, and pop music. He was the first Asian artist to have SOLD OUT Wembley Arena in London for consecutively two nights. Not only is he a Singer, Musician, Actor & a Composer but he is also reputed as one of the fastest Pianist/Keyboard player in the World. He has worked with the greatest names from the Indian Film and Music Industry ranging from Lata Mangeshkar, Amitabh Bachchan, Asha Bhosle, Shah Rukh Khan, Salman Khan, Aamir Khan, A. R. Rahman, Gulzar, Javed Akhtar, Subhash Ghai, Mani Ratnam, Pandit Jasraj, Pandit Shivkumar Sharma, Pandit Hariprasad Chaurasia, Pandit Vishwa Mohan Bhatt, Ustad Sultan Khan and Ustad Zakir Hussain amongst many others. The concert is set to be hosted at Crown Theatre, Burswood, WA. With its impressive two-tiered auditorium and seating for up to 2,300 people, Crown Theatre is the perfect venue for major theatrical productions and world-class performers in Perth. Drinks (alcoholic and non-alcoholic) will be available for sale at the venue. • Honored with the Brand Laureate International Brand Personality award by the President of The Brand Laureate , Dr KK Johan, whilst in Kuala Lumpur, Malaysia (2013). • Bestowed with a very distinguished honour, the “Glory Of India” Award, by the Government of India (2011). • The prestigious “Lifetime Achievement Award” from the PrimeMinister of Pakistan at a ceremony by Pakistan Television (2010). • "Best International Act" at the UK AsianMusic Awards (2008). • Only artist in all of Asia & Europe to have endorsed Pepsi Cola and Coca-Cola together. • Reputed and recognized as the fastest keyboard player in the world (First by the Swedish radio and television Broadcasting and then followed by the popular American magazine “Keyboard”). • The only Asian artist to have sold out, Wembley Stadium, London, in 2003 for two consecutive nights. The latter won him a place in the Limca Book of World Records. • The Bolan Academy Award. • Special award by - UNICEF (for the song he wrote for famine-hit Ethiopia as a teenager). • A United Nations Peace Medal - for a song he wrote and performed for Africa.